This rig can be purchased at anytime before close of auction and we offer speedy delivery. Give us a call to make this one yours today! 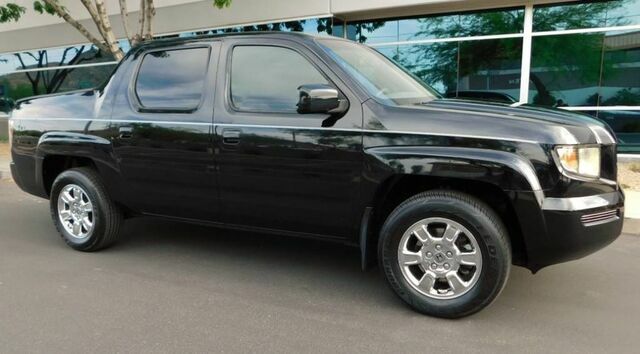 2006 Honda Ridgeline 4 Wheel Drive V6 with 144,842 miles. This rig is loaded with all the right power options and is amazingly well preserved for it's age and miles. This unit was just traded in by the previous owner because he needed a larger truck that would pull a 5th Wheel RV. We just fully serviced this unit and everything works properly. This one starts, sounds, shifts and feels great. Drives extremely straight and true with ice cold A/C. ARIZONA SINCE NEW CARFAX MEANS ZERO RUST! The sides are extremely straight and the paint still shines. This is not a beat on abused unit. One look it it's interior/exterior cleanliness and it quickly becomes obvious the one has always been cared for. This truck looks exactly as clean in person as the pictures show it to be. The interior is very clean and well kept with barely any signs of use. Never smoked in and zero signs of pets.The driver seat edge leather shows zero wear and the entire interior looks like new. The exterior is in great shape as well. No major dents or scratches. Only faults I can find are minor Expected rock chips have been touched up with the exact color.